Do you know what you call tree seedlings that come up all over the garden? Yes, they are weeds. But there are some gardeners who get all “funny” about pulling tree seedlings as weeds, especially if the ‘seedling’ gets big enough that it won’t pull out easily and it’s a nice tree like a redbud, Cercis canadensis. They convince themselves that maybe where that tree seedling sprouted would be the perfect place for another tree. And wouldn’t it be fun to have a tree in the garden that grew right there from a tiny seed? Or maybe they try to transplant those tree seedlings to someplace else in the garden, merely because Mother Nature has provided them with a free tree. Either way, enough of that kind of thinking and pretty soon, it’s not a garden anymore. It’s a mess. There are, of course, some tree seedlings, like mulberries and cottonwoods, that every gardener recognizes as weeds, no matter how big and tree-like those seedlings get. I pull out a lot of mulberry and cottonwood seedlings in my garden. The seeds come a long way to get here because there are no mature trees nearby. But I still pull the seedlings out when I find them. I show no mercy. I don't blink. I don't hestitate. The mulberry seeds, Morus sp., usually hitch a ride to my garden in the gut of a bird. The bird eats the mulberry seed, flies to my garden and then poos a few droppings with the seed still intact in them somewhere where I don't want a mulberry tree to grow. Those droppings, by the way, stain whatever they land on purple. Then wherever that dropping landed, that freshly scarified mulberry seed sprouts and grows, taking root in even the tiniest bit of dirt. Somehow, the mulberry leaves tend to blend in to their surroundings until the little tree seedling is a big tree seedling and I’ve got to get a shovel or pick axe to dig it out. When I’m feeling lazy, I sometimes just cut those mulberry tree weeds down to the ground, but they always re-sprout. Always. There are some that I cut down weekly throughout the summer. The cottonwoods, Populus deltoides, are just as weedy as mulberries. Those seeds ride in on the wind from who knows where, wrapped up in their fluffy cotton-y covering, fall gently to the ground, and then germinate. I have no idea where the nearest cottonwood tree is, but I bet on any given day I can find a cottonwood tree seedling somewhere in my garden. I’m in a battle with these tree seedlings and what’s at stake is the very survival of my garden as a garden and not a wild space. They want to take over, and I won’t let them. I pull the little ones, dig out those that won’t pull out easily, and keep cutting back those that thought they were going to make it. It’s my garden, my design (such as it is) and I’m only going to let the trees grow where I plant them! Oh man, I have pulled up so many maple and crabapple and other seedlings, I am ruthless! We show no mercy to tree seedlings - for us it is Ash, silver birch and holly. They would take over if they could. I feel funny pulling up tree seedlings, but only funny for not pulling them up sooner. We get Loblolly Pine, Red Maple, and various Oaks coming up like crabgrass. Here it is white pine seedlings and oak. I say 'My garden, my rules' so I am in your camp on this one. Tree weeding is just a part of life in the garden! 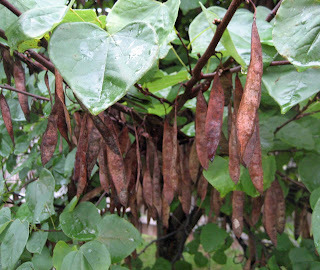 I'm one of those who would transplant the wayward redbud. I think it depends on the type of tree and if you have a place for it. I potted up a tulip poplar tree that I didn't have a place for in the hopes that I can find it a home. No sense letting a good tree go to waste! They can be a nightmare to keep after in the garden. Maple, Pecan, & Mimosa are common tree weeds I have to keep in check. I think tree weeds are much worse than "common" weeds. Just thinking about the ones I didn't get pulled at the end of the season and now will take twice as much work, ugh. Though this is a good reminder for me to put this on my list of first jobs this spring — should I get around to making such a list! For me, it's Arizona Ash and various kinds of oak (there are about 6 different kinds in the neighborhood..no kidding!). So, I ruthlessly go, pulling up forests of seedlings. Paul Bunyan's got nuttin' on me! One of my neighbors has a Norway maple. Nuff said!! Here sugar maples are the worst offender followed by oak and an occasional cedar. Well-stated post Carol. I read all my thoughts on the subject in your words. Prince Charmaing won't allow me to pull any tree weeds. None. Zero. Zilch. That's why we now have a tulip tree growing right up by the porch. *LOLOL* I am one of those who had to TRAIN myself not to grieve over the wee little "free plants" .. Like the cluster of wild cherries which had grown(OVERgrown) along the front of my pond, obscuring all but a mere smattering of view of the pond from the house.... As I looked closely, there were eleven six foot trees. PERISH THE THOUGHT! Out came the pocket saw. And Now There are .. (still) four. One will say Good Bye come Spring, methinks.. SADNESS! But neccessary if I wish to see anything..
Must be the Frugal Scots in me. "FREE"? we must not waste it! I've always called them weed trees, Carol. You didn't mention the most prolific one in my garden: Ailanthus altissima, or tree of heaven. That the mulberries, black locust, and Hibiscus syricus keep me busy. One of my neighbors would never pull up a weed tree which is why her back yard is a mess. You've got the right idea about being in charge. It's your garden and you get to decide which trees grow in it. I like that. Every spring I spend hours pulling Boxelder seedlings. However, I'm glad I recognized & didn't pull the volunteer Cornus alternifolia seedlings that showed up years ago. They are delightful, but I still have to pull out their seedlings when they show up in a bad place for them. If I had acreage, I'd let them form a naturalistic little grove. Canada's first national anthem was the "Maple Leaf Forever". In my garden it's the maple tree all over the place. Any plant in the wrong place might as well be a weed. I say, "Be Gone! and Good Riddance". My weed tress are primarily Styrax, sasafrass, oak and catalpa.They are worse than most other weeds as their roots go down very deep, very fast. AARGH! I have Sugar Maples that love to grow in my flower garden at work, and a dreaded Norway Maple in my neighbors yard. I study trees for a living so it's especially hard for me to pull up a weed tree. Luckily, there aren't any basswoods close enough to weedify my yard so I don't have to do violence to my study species! We get Ailanthus by the literal handful (and they smell bad when pulled, an added bonus), silver maple, elm, mulberry, ash, and the occasional horse-chestnut that usually grows two feet tall before I notice it. Stupid squirrels. I once found a seedling black locust that I'm sure was in its first year; it had gone to fruit already. Now that's a successful weed.